InCoax participated and presented In:xtnd™ at the Gigabit Access conference in Cologne 2-3 April. InCoax participated at the Gigabit Access conference with the theme “Strategy and Innovation for Next Generation Networks”, which included presentations, round-table discussions, panels, speed-dating as well as a minor display area. 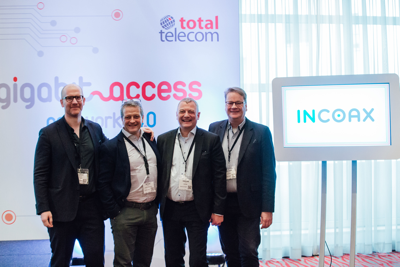 Helge Tiainen, Business Development Manager at InCoax, moderated a round-table discussion on the topic “The importance of convergence for access networks” and also held a presentation: Technology for Fiber Deep Access Extension. Helge Tiainen is the chairman of the MoCA Access™ working group inside the Multimedia over Coax Alliance (MoCA®) and part of the Board of Directors of Broadband Forum. “During Gigabit Access we have had follow-up meetings with existing customer leads and defined the next steps. We have also been contacted by new potential customers, where we will evaluate the potential and possibilities”, says Håkan Rusk, Chief Sales and Marketing Officer at InCoax. The Gigabit Access conference and the collocated conference Networks 4.0 together have approx. 300+ attendees from 150+ companies located in 40+ countries. Most of the participating companies are telecommunications and/or fiber operators.